Susannah (Barnhouse) Stoner was born in 1854 in Fayette County, PA, the daughter of Harrison and Catherine (Minerd) Barnhouse. She and her husband were pioneer settlers of eastern Kansas, and became prominent fruit growers of Colorado. Susan was raised in and around East Liberty (Dickerson Run), Fayette County. She is seen here, standing at left, with her sisters Esther Freed (center, of East Liberty, near Vanderbilt) and Clara Huston (right, of Johnson County, KS). On April 18, 1872, she married Jesse Anderson Stoner (1851-1929), by the hand of the Rev. T.P. Patterson. Jesse was born in East Liberty, the son of John and Martha Stoner. The Stoners had eight children. Three died young -- Harry and twins Pearl and Earl. The five children living to adulthood were Frank Stoner, Jessie Young, William B. Stoner, Laura Whitehead and Mattie Roussell. In about 1878, Jesse and Susan made the major life decision to move west to Kansas. They first lived near Susan's sister and brother in law, Clara and Boyd W. Huston, in Ochletree, Johnson County. They later migrated to Mount Ida; Ottawa, Franklin County (circa 1899); and Paola, Miami County. In 1899, Susan's sister and brother in law, Esther and Christian Freed, took a "long trip" from Pennsylvania to visit the Stoners in Ottawa. Upon returning, Christian wrote a lengthy report of the trip, published in the Connellsville (PA) Courier. Among other things, he wrote: "We arrived in Ottawa in time to see the windup of the Franklin County Fair and were surprised to see such a gathering of people, and such a large collection of fine stock and agricultural products. The farmers came in in their fine surrys and buggies, instead of wagons, which certainly is an indication that the Kansas farmers are prosperous." In 1911, the Stoners relocated to Colorado, settling in Palisade, Mesa County. During the next 32 years, said the Palisade News, Susan was "an active social worker until her health broke down... [and] was also a prominently connected with the M.E. Church there in which she did a great deal of outstanding work." 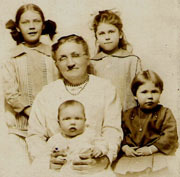 Susanna is seen here with four of their granddaughters circa 1914 -- clockwise, from upper left: Elaine Stoner, Frances Stoner, Pauline Stoner and baby Carol Louise Stoner (born Aug. 14, 1913). The girls in the back were the daughters of Jesse Frank Stoner, and the ones in front were the daughters of William Boyd Stoner. ...one of the finest and cleanest of men in his life and dealing and he worked hard in the interest of his family and the entire community. He took great pride in his peach orchard and through his tireless efforts his orchard became the finest in upper valley. He was a great booster for all ranchers and for all on the ranches in the upper valley. He was a very fine mechanic and all expert field worker, and he helped all those who knew from his great store of knowledge gained by experience of working. Despite the distance, Susan remained in contact with her Pennsylvania kin over the years. In 1906, the Connellsville Weekly Courier back in Pennsylvania reported that she was "in Vanderbilt for an extended visit with friends and relatives." Jesse died on Dec. 16, 1929 at St. Mary's Hospital in Palisade of a long-term stomach problem. Susan outlived him by seven years. She passed away at the age of 82 on Jan. 19, 1936 in the Vineland near Palisade. They are buried together at the IOOF Cemetery. For more information on this branch, contact great-great granddaughter in law Dawn Schenewerk. Photo of Susanna Stoner and granddaughters courtesy of the collection of Phillip and Dawn Schenwerk.